Terror attacks in Israel: Stabbings, bus shooting, ramming incident. 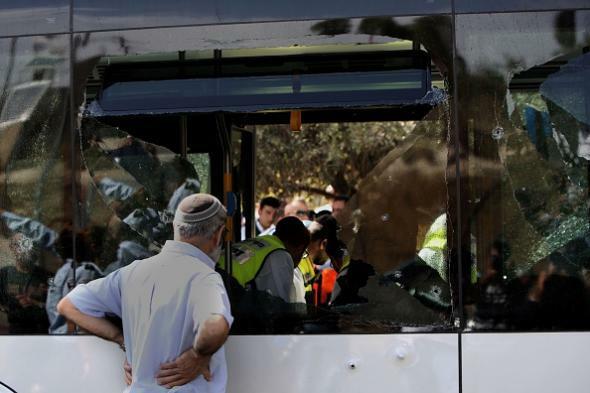 The scene of a terror attack on a bus in the East Jerusalem settlement of Armon Hanatsiv on Oct. 13, 2015. A man was stabbed in the chest in the city of Ra’anana. Four people were stabbed outside a hospital in Ra’anana by a different assailant later in the day. An attacker in Jerusalem “rammed a car into a bus station before stabbing bystanders,” killing one person and wounding two others. Two men attacked passengers aboard a Jerusalem bus, one wielding a knife and the other a gun, killing two people and injuring at least 16. The suspects in the first three incidents were reportedly Palestinians from East Jerusalem; the suspects in the bus attack do not appear to have been identified yet. Israeli Prime Minister Benjamin Netanyahu called an emergency meeting of security officials to address the attacks but has not yet announced any specific response. The recent violence developed initially out of a dispute involving the al-Aqsa Mosque and has also encompassed protests in Gaza and in the West Bank during which a number of Palestinians have been killed by Israeli security forces.